I just drank a bottle of Minute Maid Pulpy. They say it’s got ‘no preservatives added’. Aw, c’mon…It’s bottled juice. Is that even possible? So I thought maybe… they’re just saying that for product publicity. I didn’t believe it the first time I heard it’s got no preservatives added. So I read the ingredients (even the fine print) and everything checked out! It really has NO PRESERVATIVES ADDED! That means it doesn’t have ingredients that may turn out to be allergens, or worse…carcinogens! Whew! Now that’s healthy goodness that tastes so good, I… will definitely buy some more of this and share it with my family and friends. So okay, it’s got no preservatives added. That’s really good, right? Not just because it doesn’t have those icky, harmful ingredients, but it also means… I’m getting my daily dose of Vitamin C just by drinking Minute Maid Pulpy! So far anyone who still has a hard time believing that Minute Maid has got no preservatives added – meaning it’s THAT natural, it’s almost like it’s plucked straight from the tree, it’s just as Mother Nature wanted your orange juice to be, it’s got nothing but the good stuff yes, none of those potentially toxic stuff that can harm your brain, kidneys, heart; cause tumors aargh- the list of preservatives’ bad effects just go on!!! 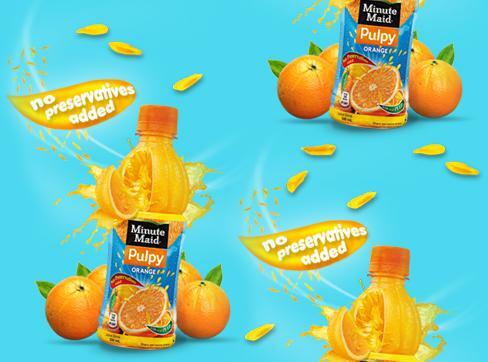 Anyway, just to prove a point on just how good Minute Maid Pulpy is ’cause it’s got NO PRESERVATIVES ADDED, I’m gonna make Minute Maid Pulpy part of my daily diet. This entry was posted in Blog Contest, Minute Maid Pulpy, Nuffnang. Bookmark the permalink. I so love minute maid pulpy and will include this too in my grocery list! I love Minute Maid! Not only does it taste heavenly, it also makes me healthy. that is what important in the process food. there must be no preservative. wow, this is new to me…i wonder if we have no preservatives Minute Maid here in U.S. I better check it! hi there! minute maid has been a long-time favorite precisely for the reason you stated. I've been hooked from the first time. The taste is perfect too! I can't name any other local brands in the market with the same quality. I drink this a lot! try the new flavors- I tasted the Grapefruit flavor & the Green Grapes with Aloe vera tidbits! So refreshing! It's definitely true, it is really good to Wake up our taste buds first thing in the day with a bottle of chilled Minute Maid Pulpy orange. It is surely no preservatives added. As a nurse, I'm conscious about my health, that's why i love minute maid!! It's naturally healthy and freshly extracted from oranges.. I just love Minute Maid's orange pulp!